LRP Automotive strives to be the full service automotive repair facility that can facilitate every ones needs. Simple maintenance like oil changes, tune ups to major engine repair or replacement. We can do it all. No matter what you drive, we can ensure proper service gets done right the first time, every time. LRP Automotive offers complete auto care for your vehicle. Whether it’s time for your next factory recommended maintenance visit, a routine oil change, new tires, or repair services on your brakes, muffler and exhaust, suspension, air conditioner, or any other mechanical or electrical component of your car, LRP Automotive is ready to serve you. When it comes to a big investment like your car, you need a reliable and trustworthy mechanic to keep your vehicle running. LRP Automotive provides fast diagnosis using the latest technologies, and will provide you with a complete range of service and repair options. If repairs are needed, our professionals will know exactly what to do. 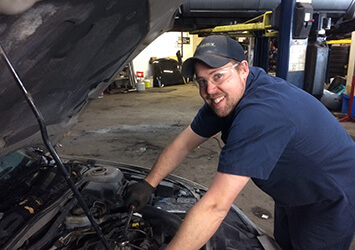 When we repair your vehicle, rest assured it'll be returned to you tuned up and running great. Fast, same day service is always our target! 100% customer satisfaction is our most important goal. No Surprises, All quotes are pre-approved by you. Honest, If it isn't broken, we won't fix it. Period! Convenient FREE courtesy rides, when possible. Click/Tap on each service to find out more info. It’s a good idea to have your brakes checked. At LRP Automotive, if our inspection reveals you do need brake repair service, we will explain what's required, what’s optional and provide you with an estimate before any work is completed. Every part of your vehicle serves a purpose, but one area that often gets neglected are your tires. Having the proper tires for your car can improve your fuel economy, handling, and your overall safety. Tips on keeping your tires in good working order: regularly check tire pressure, rotate tires every other oil change and check for nails or other sharp objects that may have gotten stuck. 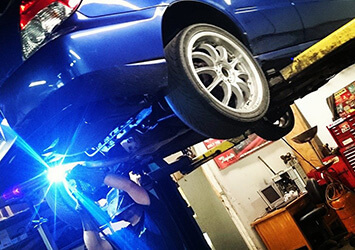 Are you outfitting your car with the latest exhaust kit or do you need a repair? Whatever your need, LRP Automotive can tackle the job and get it done right. The muffler helps silence the banging of the pistons in the engine by filtering the exhaust gas through a baffle-filled cylinder (the muffler). Without a muffler, you hear that incredibly loud noise; that's the reason all provinces have motor vehicle laws which require cars driven on the road to have a working muffler. Fortunately, they're relatively inexpensive to replace. In fact, most mufflers have free replacement warranties on their products. What they don't tell you is that most of the time, it's not the muffler that fails. It's the pipes and clamps which attach to the engine and go to the muffler, or the tailpipe which rust out and need replacing. Vehicle air conditioning repair can include a variety of tasks ranging from small to large-scale. Everything from an annual inspection or performance check to diagnosis and replacement of system components can be completed at LRP Automotive by a qualified technician. Regular inspections help ensure cooling efficiency and identify possible refrigerant leaks. Electrical systems are now more complicated, but more reliable and easier to diagnose and remedy with the proper equipment. At LRP Automotive, we have a full line of manufacturer certified diagnostic tools. The tools, scanners and equipment are the same or better than those used in dealership service departments. Your engine uses a series of interconnected components to deliver a spark, send fuel, and push airflow into the engine. If the controlling components wear out and fail to provide those three necessary elements, your engine will not properly complete the combustion cycle. To ensure your engine receives air, fuel and spark all at the right proportions, the skilled automotive technicians at LRP Automotive can perform a tune up service on your vehicle at regular scheduled intervals. Engine oil provides three key functions. First it helps keep engine components working smoothly together. Secondly, the inside of an engine can be a hot place, and oil helps draw hear away. Lastly, it helps prevent carbon and varnishes from accumulating in the engine. 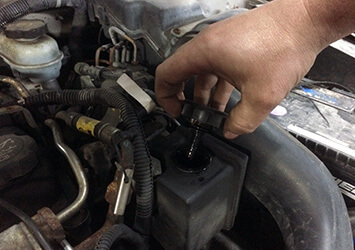 Regular oil changes help prevent engine failure and costly repairs. LRP Automotive uses regular oils, semi-synthetic oils, and full-synthetic oils to meet you vehicle’s requirements. Keeping your car rust-free prevents serious damage and maintains the look and value of your car. The oil spray is applied to a vehicles underside as well as inside doors and fenders. It has a creeping agent which allows it to seep into seams and other hard-to-reach areas. Performing routine preventative maintenance will extend the life of your vehicle and is the best way to minimize the need for more costly repairs resulting from serious breakdowns. LRP Automotive can look up and perform factory scheduled preventative maintenance for all makes and models. Call us at (905) 725-7726 or send a message below to make an appointment. Your message has been sent. Someone from LRP Automotive will reply as soon as possible. There was a problem sending your information. Please try again later. Conveniently located downtown Oshawa on Richmond St. W. Beside the John Howard Society.